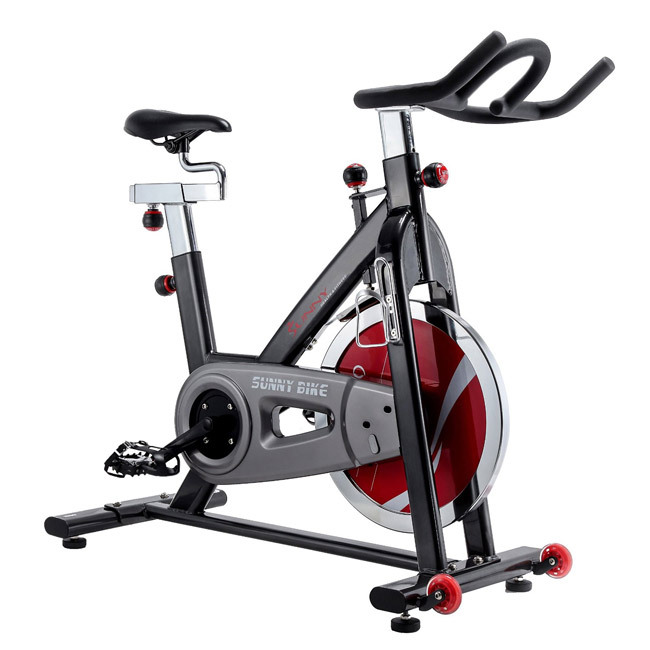 The Sunny Health & Fitness SF-B1002 (Belt Drive) Indoor Cycling Bike is Sunny Health’s highly rated upright exercise bike for home use. A low priced home bike with many features and solid quality. This model features an upgraded Belt Drive instead of a chain drive for smoother and quieter workouts. Upright cycles have a heavy front flywheel, which gives the experience of riding a real bike. This is the same type of bike used in Cycling Classes at the gym. Indoor Cycles give you the same feel as cycling on the road with a bicycle. The Sunny Health SF-B1002 will provide an excellent cardiovascular workout with low impact on your joints. The Sunny Health SF-B1002 features a 49 lb. flywheel, which creates a secure, quiet, vibration-free workout, and features adjustable resistance that simulates actual riding. Variable resistance thru a tension knob, and press down brake system. The padded seat and handle bars are fully adjustable for the perfect fit. The bike has a heavy duty steel frame. Transportation wheels are provided for portability. Bike Warranty: 1 year Frame Warranty; 90 day mechanical parts. Smart-Review Commentary: The Sunny Health SF-B1002 (Belt Drive) indoor cycling bike is an excellent upright bike for home use. This indoor cycle is simple with no electronics, with manual resistance, with riding similar to a real bicycle on the road. The heavier weight of the Sunny Health SF-B1002 makes it more stable than cheaper exercise bikes. It has a heavy 49 lb. flywheel along with the belt drive which creates a smoother ride. The belt drive on this bike will give a smoother and quieter ride than a chain driven bike. Adjustable resistance with a press down brake system is provided. This model should fit the needs of most people, as its maximum user weight is 275 lbs. The steel frame is built for added stability. Toe straps are included. The Sunny Health SF-B1002 has the same look and feel as the Cycling Bikes you would see at a commercial gym. This type of bike is also ideal for outdoor cyclists to train indoors. Sunny Health & Fitness provides a padded seat that is adjustable for added comfort. This model has received excellent consumer reviews. The Sunny Health SF-B1002 is a Smart-Review Top Pick for exercise and indoor cycling bikes. Description: The Sunny Health & Fitness SF-B1002 indoor cycling bike is our least expensive indoor cycling bike with belt drive. Along with very good customer reviews, this model has a 49 lb. flywheel for smooth cycling. This model also has a 275 lb. maximum user weight capacity. This model is a SmartReview Top Pick.